A funny thing happens when you tell a boater that you’re headed to or coming from Coinjock Marina. 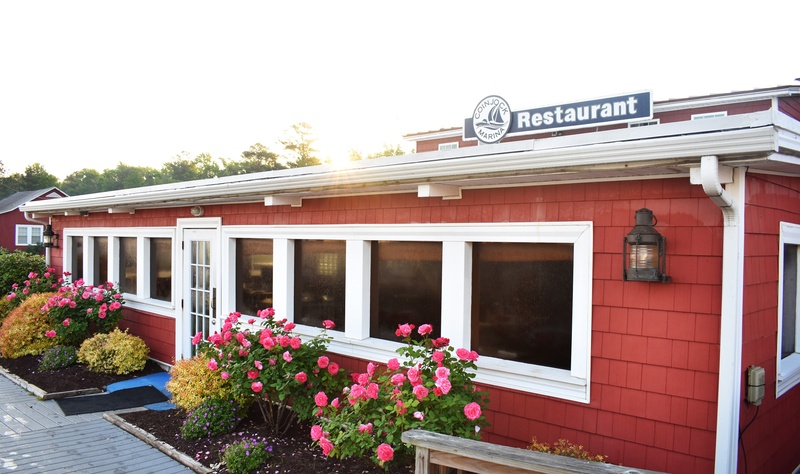 Anyone familiar with this famous ICW boating stopover will inevitably ask you if you had the prime rib – it's one of those things. 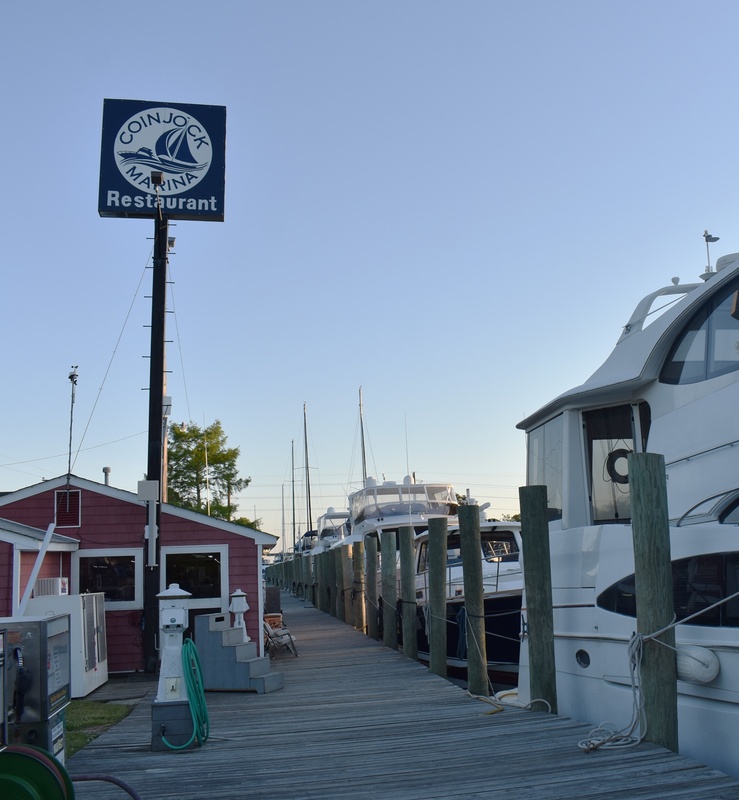 Here's one take on one of the most famous marina dishes on the East Coast, along with nine other simple things to love about Coinjock Marina. Even having armed myself with a nice point-and-shoot camera just days before arriving at Coinjock, I still can’t take a good photo of food because I cringe watching other people do it. But the fact remains: after a long day of travel, a steak and a beer hits the spot, and the ICW-Famous Coinjock Marina Prime Rib lives up to its reputation. Another reason to get the prime rib is honestly the number of people who will ask you if you did. If you don't you may regret not earning this carnivore's badge of honor. If you're trying to cut back, the kitchen will wrap up your leftovers for you – in fact one boat ordered an extra for just that reason. Prime rib is hard to come by on the ICW! Note the top of the restaurant, above, where the marina's new furnished apartment is located. In the winter Coinjock keeps busy by renting out the property's cabins and apartments to host groups for duck hunting season. Pro-tip: Once you know you’ll make it to Coinjock Marina's docks in time, make two phone calls: the first to let the dock staff know your ETA, and the second to make your dinner reservation. The ETA is critical – if you're not going to make it past that last bridge, let the marina know so they can get other boats into your spot. When you’re far from home you can rely on your favorite go-tos, or you can branch out and discover something new. 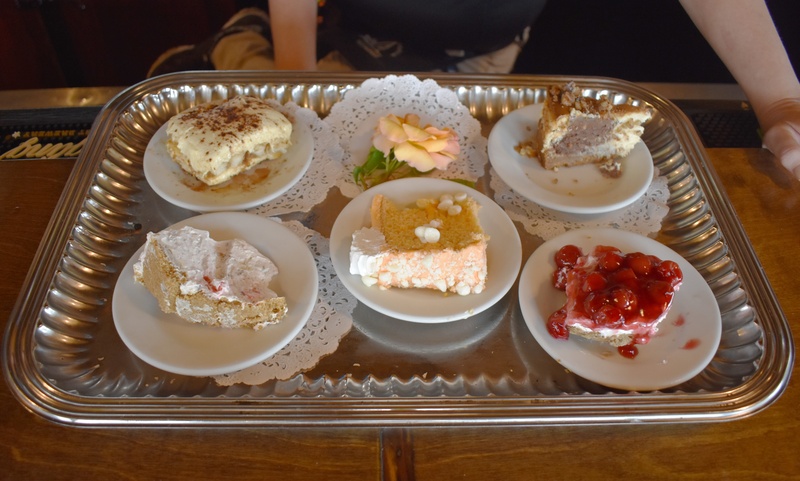 When one of the cooks at Coinjock emphatically recommended the cherry pie, it would have been rude to refuse, and I can now personally highly recommend it as well. You won't find muddled cucumber or bottles of Veuve popping at Coinjock – and thank goodness. The beer and booze selection is solid, so all you have to worry about is which stool to pull up to the bar to relax or make friends. If you’re tucked away on your stern avoiding interaction or sitting below trying to get work done while cursing the bad Wi-Fi (which I've been guilty of myself – just not at Coinjock), you’re missing out. The captains and crew I met within moments of sidling up were fast friends right out of the gate. 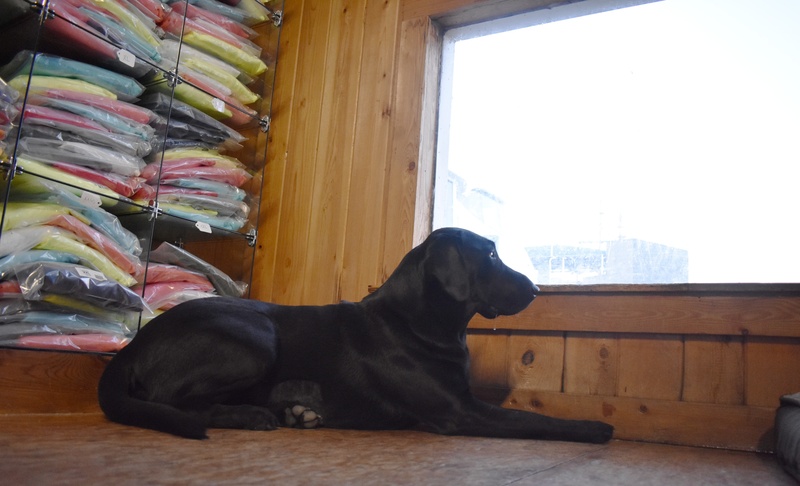 When I first met this little lady – named after the Gadwell ducks she likes to chase – she was waiting patiently for her humans to close up shop. When next we met, she was back on the dock bright and early the following morning, not-so-patiently waiting for the shop to reopen so she could reclaim her territory. Gaddy's a total sweetheart, and like all dockdogs, adds to the marina's homey feel. A quick tangent to toot our own horn: When I first walked into the ship's store (had to pick up a "Where the heck is Coinjock?" bumper sticker), JW had just gotten off the phone with a boater who'd made a reservation online and was surprised at how easy it was to use. The Coinjock guys made it clear that they can and would do just fine without Dockwa – and we believe it – but all the same the app was working really well for them. Particularly at night; Coinjock often gets more reservations at 9 or 10 o'clock at night after they've closed up than they do throughout the day. 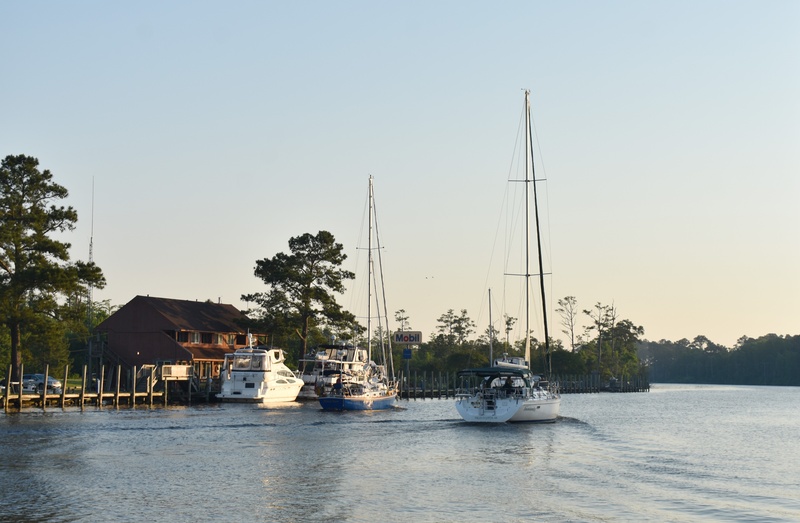 The team has also noticed boaters will have better success booking online a few days in advance, which works out well at a packed marina like Coinjock where last-minute reservations can be a gamble. Boater Pro-tip: Use Dockwa to book your reservations as soon as you know your ETA. Marina pro-tip: Send us suggestions and feedback, it's a big part of how we choose what to build next. From running a well-stocked ship’s store and pumping thousands of gallons of fuel a day to closing down the bar, this team hustles. When tying up you might meet JW, who can tell you more about Coinjock from the point of view of life-long resident born and raised, or moonlighting as the town sheriff. You might also meet Louis, the owner, if he’s not in the kitchen cooking up a storm or out on a fishing charter. 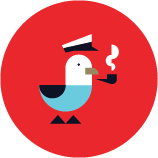 After hearing some great suggestions on how to make Dockwa's software work even better for them, our team's been working on new solutions. It's thanks to great partners like Coinjock who help Dockwa get better for boaters and marina teams, and we all know a rising tide lifts all boats. I’m always up early when I’m on or near the water and some sunrises stick with you more than others. Tying up in Key West, Fort Lauderdale, Boston, early mornings are my jam. Walking the dock at 6AM – before the boats head out and before Gaddy comes out with her tail wagging– there’s definitely something special about a quiet morning in little ol’ Coinjock. How do you talk up a patio? It’s a patio. It’s wood planks and plastic chairs. Still, the patio at Coinjock earns its spot on the list as another place to sit back, relax, and share intel with your fellow ICW-travelers. With Coinjock, you get a unique setting in which most people in sight are there with the same mission, but everyone has a different story. 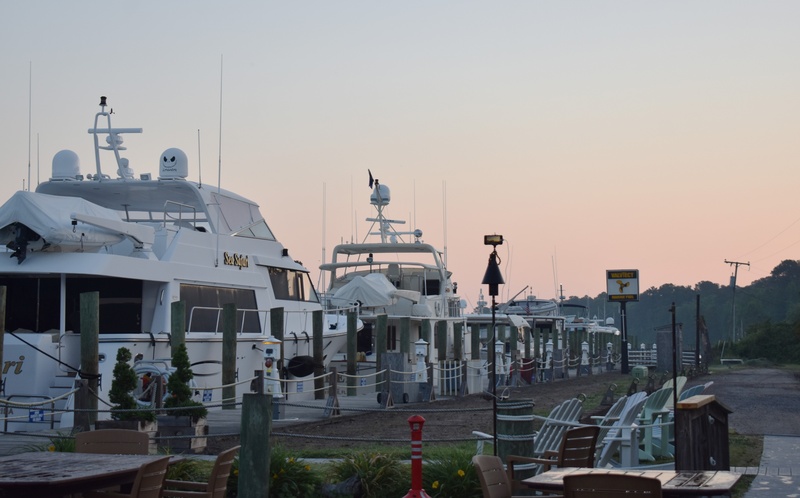 Along with the patio comes a free education in how hard marinas work to accommodate boaters. 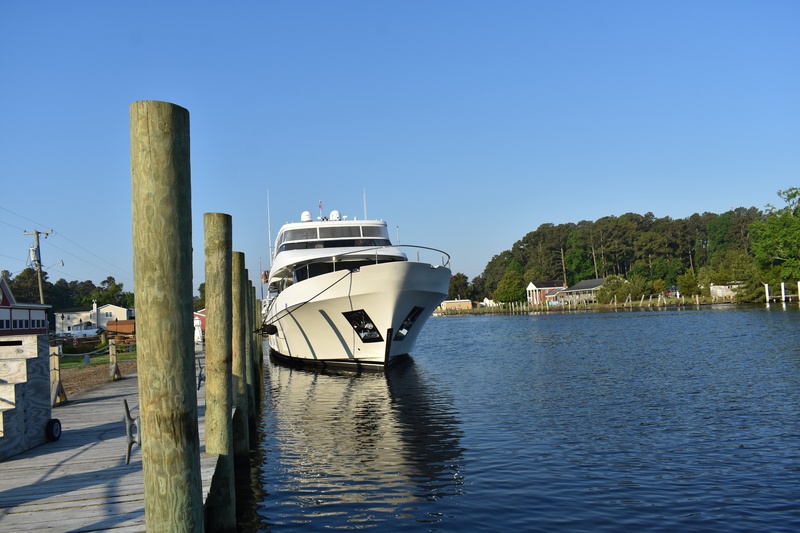 You'll see from the patio as the staff makes sure each boat takes up the least amount of space. Boater Pro-tip: Be honest about your length overall – not just at Coinjock, at all marinas. LOA matters! 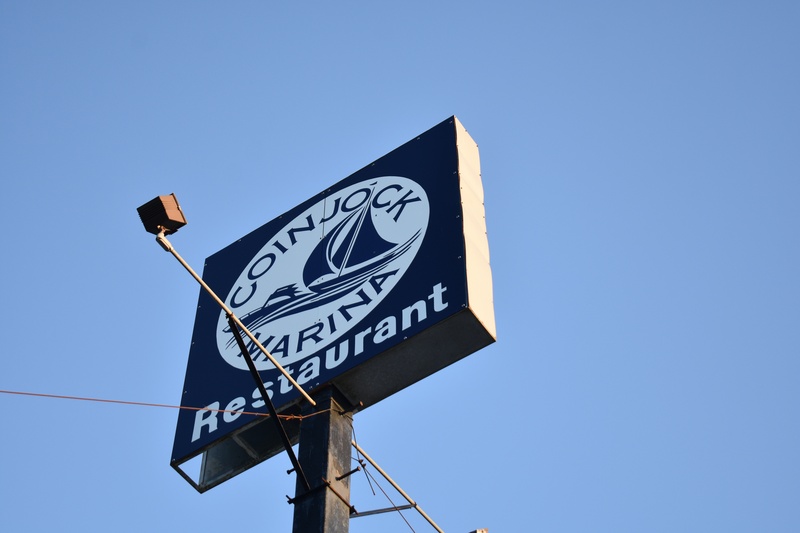 The people make the place, and when you make your reservation at the Coinjock Marina Restaurant, you’re in good hands. This crew has their work cut out for them with the nightly influx and each person keeping a spring in their step the whole way. I had a blast talking with Rebecca the bartender after the mass exodus of boats. “How hard is it to just be nice?” she asked after a sour boater walked out. She's seen a lot of boaters, and some of the richest men with the fanciest boats, she said, seem the grumpiest. And so it went that while talking shop, we stumbled into a brief philosophical discussion of what people value in life and what amount of happiness money can and can't buy. Boater Pro-tip: Be nice. How hard is it? Just before leaving Coinjock, a sailor shared with me his decades on the water and love of his home and family on the ICW, contrasted against his time serving in the military and the goodbyes he’s said to his brothers in arms. Some stories you can't do justice to in the retelling; their not yours to tell. Suffice it to say that oftentimes the best part of any marina, sailor bar, boatyard and the like, is shutting up and listening. Topping the list are the technical details, because above all else Coinjock Marina is an expertly-run operation in a clutch location. They overlap million-dollar yachts and pump more than a million gallons of fuel a year. 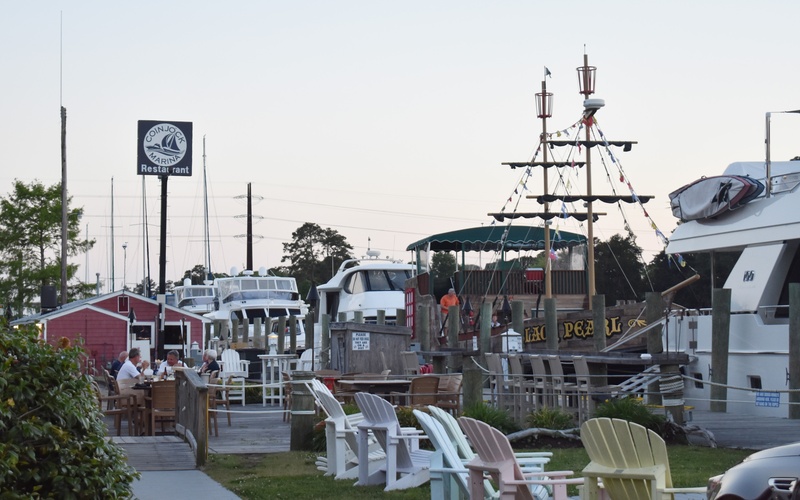 Located at Mile Marker 50 on the ICW, Coinjock boasts newly refurbished docks, an easy approach with alongside dockage, fuel, pump-out, Wi-fi, laundry, ice, and a well-stocked ship's store. These guys will do everything they can to accommodate you, so in the unfortunate instance you do get shut out, just know it's not for lack of trying on their part. Thanks again to the crew at Coinjock Marina for the hospitality, from Louis and JW and the team to the boaters who kept things interesting. 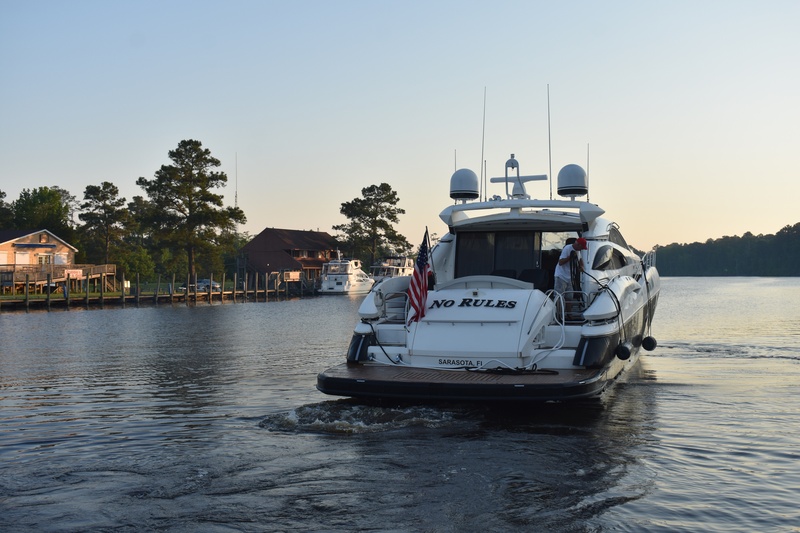 See you back on the dock or out on the water!